Pryscedwin is the name of one of five early hamlets of the parish of Llandeilo Talybont. The others were Ynsyllwchwr, Glynllwchwr, Gwenlais and Tirybrenin. The latter was incorporated within the new parish of Gorseinon in 1913, leaving the other four with Llandeilo Talybont. 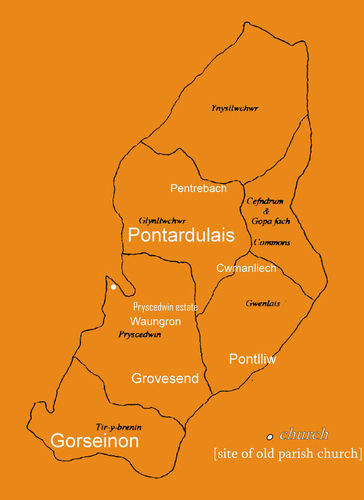 The village of Pontardulais is the major settlement within that parish, along with Pontlliw, Grovesend, Waungron, Cwmanllech and Pentrebach. Grovesend, Waungron and southern parts of the village of Pontardulais lie within the hamlet of Pryscedwin as did the ancient church of Llandeilo Tal-y-bont as well as the once renowned Pryscedwin Estate. The earliest recorded form of the Pryscedwin place-name occurs in the work of the poet Llawdden as Bryscedwyn c1420 [Gwaith Llawdden p239]. Although not born in the parish of Llandeilo Tal-y-bont, Llawdden had an affinity and a close association with the parish having spent some time as a youth at the home of Ieuan Gwyn at ‘Bryscedwyn'. After returning to the parish for the first time in ten years he wrote a cywydd titled Moliant Ieuan Gwyn ap Gwilym Fwyaf o Bryscedwyn a Goleuddydd [In praise of Ieuan Gwyn son of Gwilym Major of Bryscedwyn and Goleuddydd (his wife)] in which he recalled the wonderful times and hospitality that he experienced there. Ieuan Gwyn was reputedly from the line of Bleddyn ap Maenyrch and was born around 1370 [Gwaith Llawdden p239]. Like many other aristocrats of the time, he was a local officer of the Crown. It is possible that Goleuddydd was a sister of Hopgyn ap Tomas of Ynysforgan. Ieuan Gwyn and Goleuddydd were the ancestors and founders of the famous Lloyds of Pryscedwin. A pedigree of the Lloyds of Pryscedwin dated 1697 names Thos ap Evan Gwyn of Prisskedwyn having married Mawd daughter of Howell Melin. One of their sons, Dafydd is the subject of a poem by Lewis Glyn Cothi, Moliant Dafydd ap Tomas, (c 1460) where he locates his mansion ym Mryscedwyn. Dafydd's elder brother Rhys Llwyd is also linked with the place-name in Clark's Limb. Pat. P210 - ‘Rees Lloyd ap Thomas of Priscedwyn, who bore ‘Argent, a stag lodges proper, attired or, biting a broom pod proper, married Jenet d. of Morgan Hopkin of Gower.' The 1697 pedigree however, has Rees Lloyd ap Thomas as ‘Rees Lloyd of Gower, married Anne d. of Watkin Vychan of Bradwarden.' Bartrum [Bl. ap Maen. 34(A1)] agrees with the 1697 pedigree. In 1578, the historian Rice Merrick wrote that ‘Pryscedwyn, the house of Thomas ab Ieuan Gwyn ap Gwilym Ddu and so lineally to Gruffydd Gwyr. Now [c1578] purchased by John ap Rhys ab Ieuan of Queen Elizabeth'. [Morg. Arch., James 1983, p120]. John ap Rhys ab Ieuan was also known as John Price of Cwrtycarnau, brother of Lleisan Price M.P. and Raphael Price and brother in law to Rice Merrick. 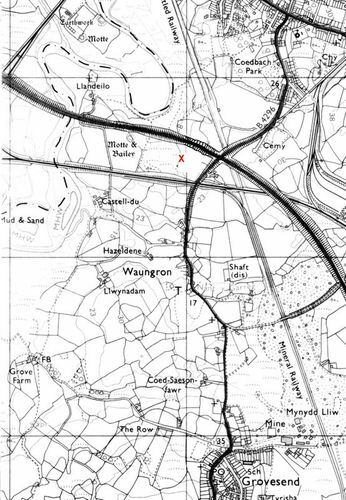 The place-name appears as preskedwin and preskidwen in Peniarth 120 (1584-85) and as Pryskedwin in a Gower survey of 1650. The survey names Walter Lloyd as tenant there, while William Lloyd is named at Preskedwyn in 1665 (Bronwydd 2b). Walter Lloyd is recorded at Briskedwin again in the Free Rents Surveys of 1692 as are John Meyrick gent. and Jon Bevan. The Lloyds continued at Pryscedwin for another 80 years or so, until the death of William Lloyd in the 1770s. The family home was left uninhabited, became ruinous and is no longer visible. Today, the M4 motorway runs alongside the site of the old family home. As well as being the name of a prestigious family estate, Pryscedwin was also the name of a parcel in the Badminton Estate papers and, as already mentioned, one of the five hamlets of the parish of Llandeilo Talybont. Pentre Pryscedwin remains as the name of a farm just outside Pontardulais. This farm would have been a smaller, subsidiary farm on the main Pryscedwin estate. The name contains two elements, prysg and the personal name Cedwyn and can be translated as Cedwyn's wooded copse.